Created in collaboration with Amy Taylor Alpers and Rachel Taylor Segel of The Pilates Center in Boulder, Colorado, and meticulously tested for two years, the CenterLine® Chair is based on measurements used on original components — from carriages to springs to straps — upgraded with Balanced Body’s unparalleled craftsmanship and materials. This variation of the Wall Tower allows much of the Cadillac repertoire in a space-saving alternative. You get Cadillac functionality in a compact, economical alternative. 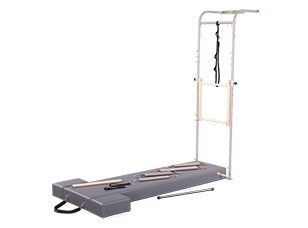 Unique to Balanced Body products, the push-through bar adjusts quickly to 8 positions along the height of the Tower, for ease of use with floor mats, raised mats and Reformers of any height. The CenterLine® Pole System is available separately, or as package that includes our Upholstered Mat and Moon Boxes. Purchase the CenterLine Pole System separately, or save $250 if you purchase it with the Upholstered Mat and Moon Boxes. Push-through bar: Constructed of solid maple and is 4-sided. 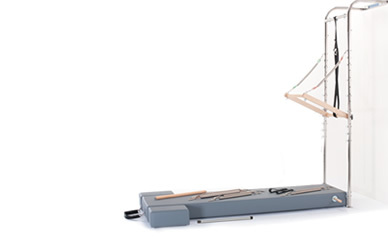 Our Slide System makes repositioning the push-through bar a fast, one-person job that will not interrupt the flow of your session. The bar adjusts to 8 heights, is quiet to use and maintenance-free. Safety strap and carabiner included. 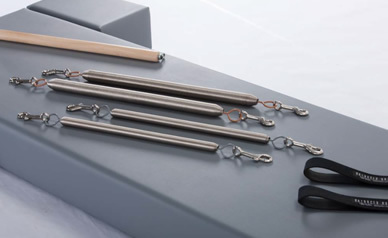 Tower springs: Balanced Body Signature Springs™ with snap hooks, package of 8. Regular length: 2 blue (light), 2 gray (light), 1 red (medium) and 1 green (heavy). Long Springs: 2 red (heavy). Roll-down bar: Solid maple, 23" long (58cm), non-swiveling with outside hooks. Raised upholstered mat, padded and upholstered, with dowel handles and foot strap (cotton). Moon Boxes (2), wood core construction, padded and upholstered. Wall Tower: 89" (226cm) high, 27" (69cm) wide and 20" (51cm) deep. Width including push-through bar adjustment knobs is 30.25" (76cm). Mat for Wall Tower (optional): 84" (213cm) long, 22.5" (57cm) wide and 6" (15cm) high. Moon Box (optional), each: 14" (36cm) long, 9" (30cm) wide and 6" (15cm) high. Moon Boxes are strong and sturdy, constructed of wood core then padded and upholstered. Heavy-duty vinyl in 35 colors. Of those colors, 9 are standard/free, and an additional 26 custom colors choices are available for an additional charge. Try our Color Tool and get more information here , or email us for a sample color palette.